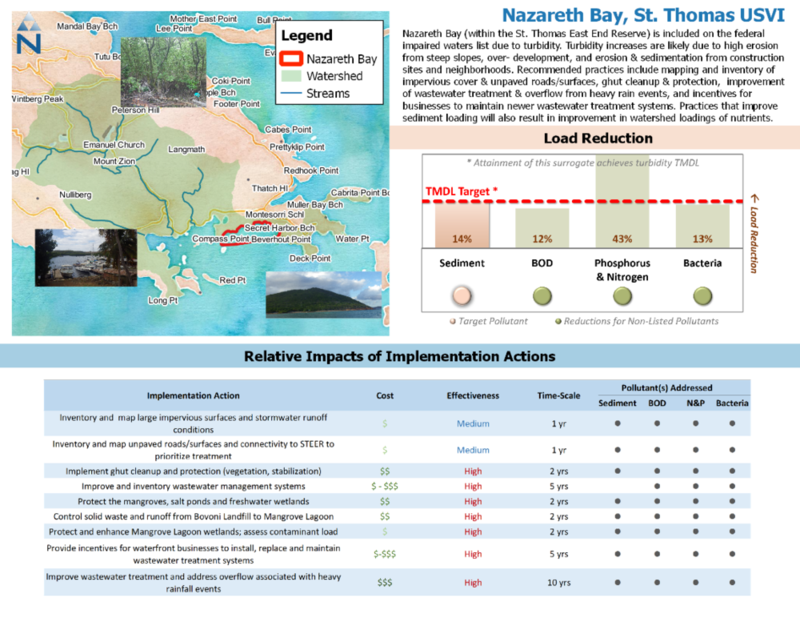 Paradigm partnered with EPA and the USVI Department of Planning and Natural Resources to promote an EPA initiative to develop implementation ready-TMDLs for nutrients, sediment, and bacteria. Paradigm worked closely with federal, state, and local agencies/groups to conduct an extensive review of available data and we developed innovative approaches for estimating pollutant loads. Continuous simulation modeling was conducted with Loading Simulation Program – C++ (LPSC). The analysis of assimilative capacity included innovative linkages between sources and in-stream and coastal water quality. Detailed trends analyses were conducted to understand pollutant dynamics. The implementation plan was developed through detailed research and on-the-ground reconnaissance surveys to better understand locally-preferred best management practices. Through coordination with local agencies, each watershed received a “report card” (see figure) to educate local citizens and businesses on the types of activities causing impairments and the impacts of pollutant sources on water quality and local reef systems.